Giovanni Antonio Canal (18 October 1697 – 19 April 1768) better known as Canaletto was an Italian painter of city views or vedute, of Venice. (A veduta, Italian for “view”; plural vedute, is a highly detailed, usually large-scale painting, or, more often print, of a cityscape or some other vista. The painters of vedute are referred to as vedutisti. Canaletto also painted imaginary views (referred to as capricci), although the demarcation in his works between the real and the imaginary is never quite clear. (In painting, a capriccio, plural: capricci; in older English works often anglicised as “caprice” means an architectural fantasy, placing together buildings, archaeological ruins and other architectural elements in fictional and often fantastical combinations, and may include staffage (figures). It falls under the more general term of landscape painting. The term is also used for other artworks with an element of fantasy. He was an important printmaker who used the etching technique. In the period from 1746 to 1756 he worked in England where he created many sights of London. He was highly successful in England, thanks to the British merchant and connoisseur Joseph Smith, whose large collection of Canaletto’s works was sold to King George III in 1762. Canaletto arrived in London in 1746 and remained there for most of the next nine years. This painting is a pendant to a view in the opposite direction, towards Westminster. This pair was the last by Canaletto, and the only English views to be acquired by Canaletto's great friend and patron, Joseph Smith, who was British Consul in Venice. They are on a Venetian type of canvas with a russet ground rather than the light grey that the artist used for most of his English paintings. This suggests that Canaletto painted them when he returned to Venice briefly in 1750-1. The view is not based on the drawing, but on a slightly different view now in the Courtauld Institute of Art Gallery. Canaletto adjusted the composition to suit the much grander scale of the painting. The view is taken from the Terrace of Old Somerset House. Its New Gallery facing the river had been built in 1661-61 for Henrietta Maria, the Queen Mother and was perhaps designed by Inigo Jones. The building was subsequently the home of the Royal Academy, and part of it is now occupied by the Courtauld Institute of Art. The skyline is dominated by St Paul’s Cathedral, completed in 1709. Canaletto altered the dome so that it is viewed from slightly below, magnifying its powerful presence. Beyond it stretches a horizon dominated by the steeples of the City churches, largely built by Christopher Wren following the Great Fire of 1666. At the right is visible the Monument to the Fire, erected in 1671-77, Old London Bridge with its houses which were demolished in 1757, and part of the south bank. 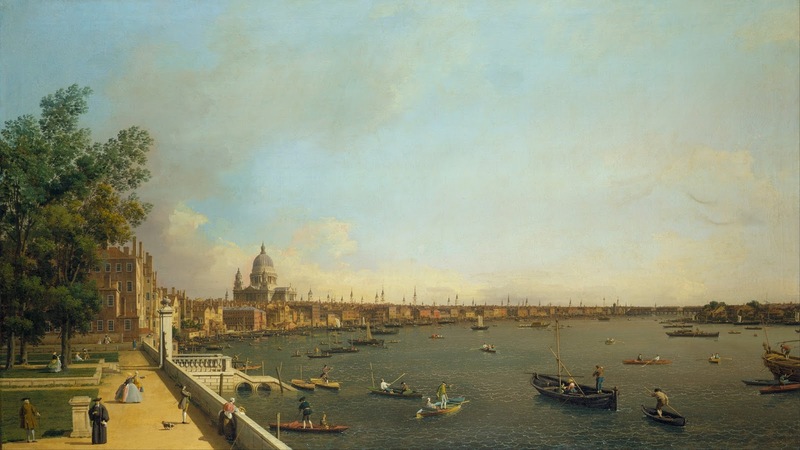 The pair of views relates not only to Canaletto’s Venetian scenes, but also to the long tradition of topographical views of London dating back to the 1600s. Earlier engraved prospects of London were usually printed on several sheets to include the whole riverside from Westminster to the Tower. During the last century artists had chosen to depict the city stretched out in a line from a bird’s eye view over the south bank. Canaletto adopted a high viewpoint for his earlier views of the river but brought the viewpoint almost to ground level here. The great curve of the river dominates the composition, which also manages to include all the principal features to be seen from the terrace of Somerset House. When the two views are placed side by side they create a long panoramic view of the curve of the river, the equivalent on the Thames of Canaletto's wide-angled views of the Bacino in Venice.